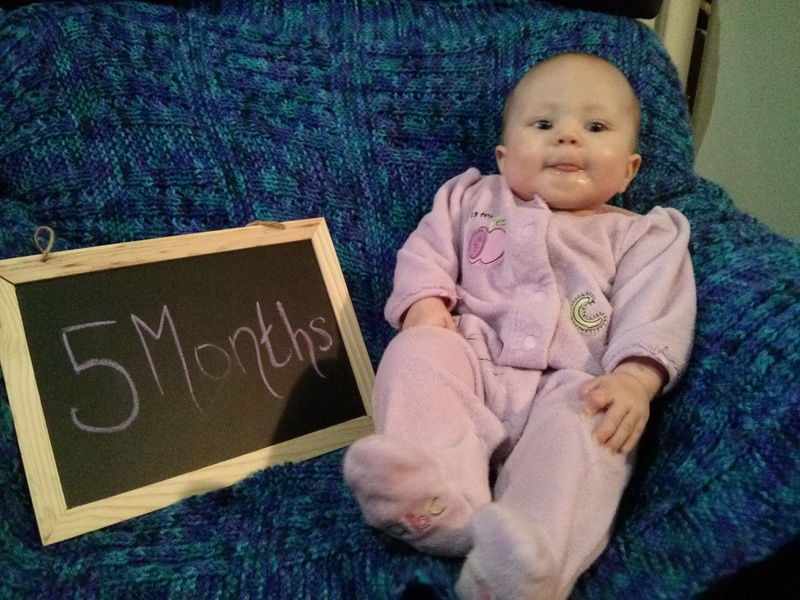 Annabelle Rose: Month 5 | Team Alzen! Enjoys “flying” and being held upside down with dad, throwing toys and hearing them hit the ground, grabbing toys, seeing daddy on his lunch break, and reading board books before bed. She also appears to like the sound of her own voice. We call it “telling stories” or “singing the song of her people”. AB typically goes to sleep sometime between 7 & 8 these days. She falls asleep with little crying and sleeps until sometime around 12 or 1 for a night feeding. She currently thinks the day starts between 4 & 5 am though, so we’re working to drop that feeding as well. Right now, she will eat around that time, play for a little while, cry again, and then fall asleep for a little bit. She is still on the pretty regular nap schedule as well, but she’s not the best napper. We’re lucky if she goes an hour without waking up once or twice. All in all sleep is definitely getting better though, and her schedule is predictable enough that I can get a decent amount of work done. I’m still not back to anywhere near my full capacity, but we’re doing ok for only being in the game for 5 months.